Madagascar Almond Tree is a deciduous tree that grows up to 10-20 m tall with an erect stem and neat, prominently layered branches. Bark is pale grey, smooth and rather mottled. Leaves are smooth, bright green when young, in branch-end rosettes of 4-9 unequal leaves on short, thickened stems. Leaves are up to 7 cm long, tip broadly rounded, base very tapered, margin wavy. 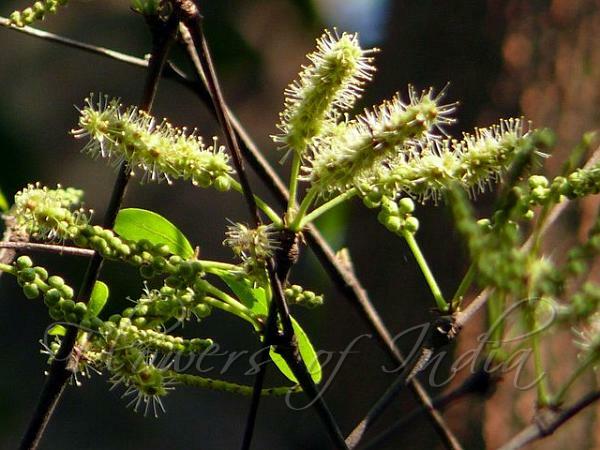 Flowers are small, greenish, in erect spikes up to 5 cm long. Fruit is small oval; seeds, about 1.5 cm long with no obvious wings. 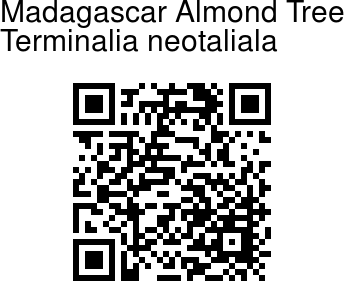 Madagascar Almond Tree is native to Madagascar. Identification credit: Aarti Khale Photographed in Lalbagh, Bangalore.